Kyoto’s fall foliage is perhaps even more impressive than its spring cherry blossoms. 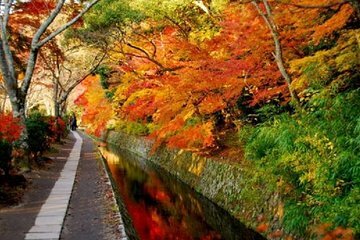 Make a special day trip from Osaka to see this historic city awash in autumn color. Your tour bus takes you to seven attractions, including picturesque shrines and temples, where you can hop on and off to explore some of the city’s most beautiful landmarks. End your day in Arashiyama with a relaxing river cruise. Child (3-5 years old) price includes a bus seat but no lunchbox or seat on the Arashiyama boat cruise. During the autumn leaves viewing season, roads and sightseeing spots become heavily congested and arrival to each place will be delayed. In some cases you may have a shorter visiting time. Please wear comfortable clothing and walking shoes as there will be quite a lot of walking involved. Warm clothing is also recommended as mornings and evenings are particularly chilly. Should the Arashiyama boat cruise get cancelled, the group fare will be refunded (JPY850/adult and JPY400/child) and the time spent exploring Arashiyama on fot will be extended.